OART runs a group of volunteers that we call “The Task Force”. The Task Force objective is to maintain and improve the habitats of our river and its many tributaries. Not just for our satisfaction, but for the benefit of future generations, and of course the ecology of the river systems. 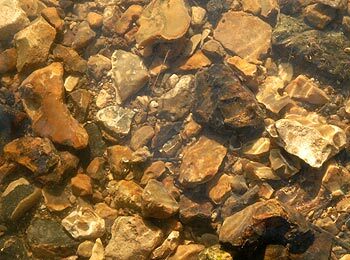 Due to man’s influence many of our rivers and streams have suffered degradation. All of the watercourses that make up the Sussex Ouse and Adur catchments have been modified to some degree for development, milling and agriculture. 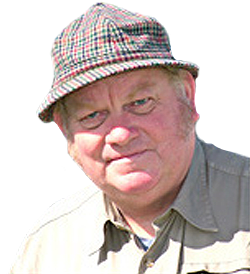 The need for water for human consumption, industry and agriculture has resulted in damaging abstraction from the river and the aquifers of the South Downs, the source of many of the Sussex Ouse and Adur chalk streams. The resultant low flows are often inadequate to dilute treated sewage causing further ecological damage. Some of this degradation can be reversed by the restoration work undertaken by the OART Task Force. All of the work carried out by the Task Force is in accordance with current conservation practices, as laid down in The OART Task Force Policy. One of the best things about being a member of a conservation organisation is that you get a chance to get outside in the fresh air and do something positive for the environment. We need more volunteers to help us with this important and rewarding work. It provides an excellent opportunity to observe the wildlife in areas not usually accessible to the general public. We provide the tools and equipment and third party insurance. The Task Force operates mainly during the summer months between April & October, outside the sea trout spawning season. Volunteers are advised to wear old clothing, wellies and protective gardening gloves. Bring a packed lunch if you intend to stay the whole day however on some outings we may organise a barbeque between us. 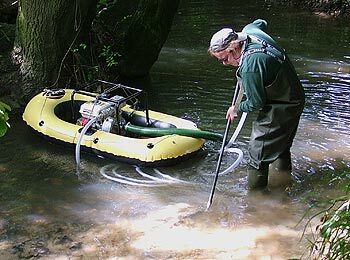 The surveys cover all aspects of river systems from hydrology and morphology to surrounding land use, invasive species and presence of diseased trees. 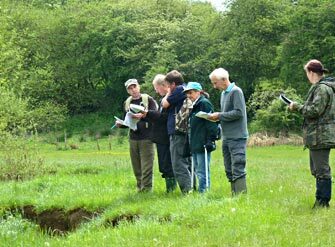 Survey methodology involves undertaking a total of 10 point surveys along each 500m stretch of a watercourse, to record a range of river features. The idea is to involve the task force members who are interested in surveying areas of the Ouse and Adur catchment in order to assist in building a long term river habitat restoration strategy for OART. The results will be mapped using a Geographical Information System (GIS) and allow future funding bids to be focused on those areas within the catchment which have been identified through these surveys. Woody Debris, both Coarse and Large, is essential in the healthy functioning of freshwater ecosystems. Coarse Woody Debris CWD comprises branches, twigs, and leaves. It provides shelter for fish fry and promotes the production of large invertebrate colonies. 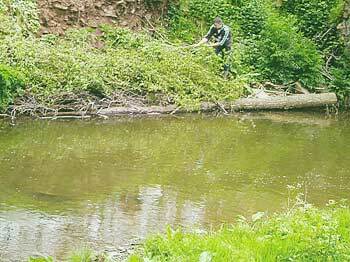 Large Woody Debris LWD is usually defined as dead wood over a metre in length, and more than 0.1 metre in diameter. Its presence in a watercourse has many benefits including – stabilisation of the river banks and bed, trapping CWD, creating niche habitats, providing space and food for colonisation, providing cover and perches and improving water quality by removing silt and allowing oxygenation. When introduced it is important that this material is anchored securely to the substrate so that it remains in situ during spate conditions. 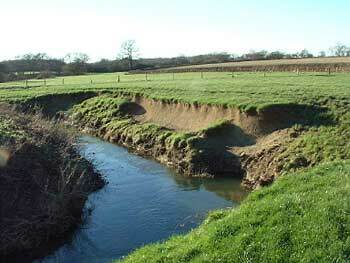 This is a particular problem with some of the Sussex Ouse and River Adur tributaries. Here in the South East this is exacerbated by the sudden influx of rainwater from the increase in impervious surfaces such as roads and roofs as a result of over-development. Insensitive farming practices such as ploughing up close to the margins of streams compounds the problem. Unfenced pastures allowing ingress of cattle also has a deleterious effect. 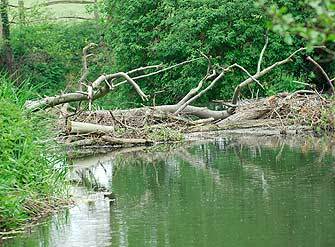 To protect banks against erosion, Large Woody Debris (LWD) or willow bundles can be securely pinned against the bank to deflect the flow. Once installed this encourages the growth of vegetation, further stabilising the bank and providing cover for fish and other animals. In-stream enhancements like channel narrowing and the creation of riffles and pools can be also be achieved using locally sourced materials like LWD. Constructing deflectors and groynes to locally concentrate flow is beneficial to scour away sediment. 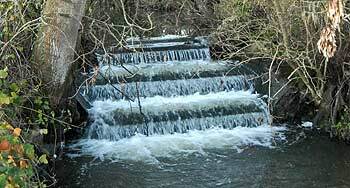 Man made obstructions such as weirs and sluices are a formidable barrier to the migration of fish, particularly sea trout trying to reach their spawning grounds. Many of the fish passes associated with these structures of the Sussex Ouse and River Adur are inadequate, or of poor design and need attending to. By simple modification to some of the smaller structures, the task force hope to extend sea trout access to new spawning grounds in the headwaters of selected tributaries. Carefully planned modifications may consist of cutting slots in weir crests, effectively lowering the height for ascending fish and the construction of small fish passes to bypass weirs. This is an annual task undertaken at selected sites each autumn. Volunteers rake the stream bed gravel to loosen it and then a high pressure pump converted into a jetter is used to blast out the silt. Another aspect of our work involves repopulating the waterways with indigenous aquatic plants. In the past, a culture of persistent dredging to facilitate land drainage has left many sections denuded of plant life. We have been successful in restoring plants particularly to the River Uck and Bevern Stream. This work continues with further diversity of species being introduced. 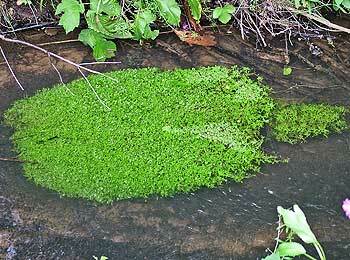 The benefit of planting water crowfoot (Ranunculus fluitans) starwort (Callitriche sp. ), and strapweed (Sparganium emersum) is greatly increased invertebrate populations. These are very important to the ecology of rivers and streams providing an essential part of the food chain for fish and other animals.